If you have been trying to learn blackjack by reading articles and online blogs, you must have observed some difference in what different sources say about playing a specific blackjack hand. For instance, I recently read in a book about a specific hand that should not be played, however, an online article that I read suggested to go ahead and hit that hand. Naturally, I got confused and so I started researching. This is what I found out. The strategy for some blackjack hands may differ depending on the (mix of) playing rules and/or the number of decks used in that game. Let’s understand this with an example. Dealer 6 means this is a 6-deck game. A simple strategy for multi-deck games with h17 (dealer hitting soft 17) is to take a more aggressive approach and double down on soft 19. On the other hand, the best idea in a 6-deck game with s17 (dealer standing on soft 17) is to stand. The chances of the dealer busting are more when they hit soft 17 and so you can be aggressive. Let’s now try another hand. This is a double-deck game. If the dealer hits soft 17 (h17), the player can choose to double down on soft 18, same as the above example. The reason is also the same as before. The chances of the dealer busting are more with h17. Now, let’s try a totally different hand. 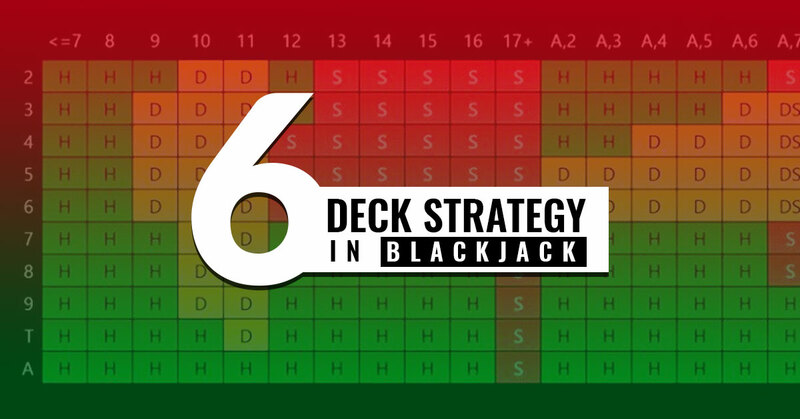 Whereas in a six-deck or double-deck game (with h17), the best strategy is to hit, when you have a pair of 7s, however, when the game is single-deck, you should rather stand than hit. Here’s why. When you already have two 7s in your hand, the probability of drawing a third 7 from the single-deck (to form a 21) to beat the dealer’s 20 is not much. This is why it is better to stand than hit such a hand. This is not true for a six-deck hand since there are too many 7s in the game and the probability of you drawing another from the deck is higher as compared to a single-deck hand. So, if you have the option of surrendering in a single-deck game when you have a pair of 7s, you should take it. Let’s take another example of a different hand. In a double-deck game, when you have 9, you should double it down against a dealer’s 2 (anything from 2 through 6 upcard). The idea is that since there are fewer decks of cards on the table, you should avoid drawing cards from your own hand and double down two small-value cards. However, in a six-card game, you should double down on your 9 only if the dealer has a 3 through 6 upcard, otherwise, you should just hit 9. The rule says that you should double down your hand of 11 only if the dealer shows a 10 or less, otherwise you should simply hit. So, in a six-deck game with s17, you should hit against a dealer’s A. However, if you are playing a double-deck game with s17 and have an 11 hand, you should definitely double down on it, no matter what the dealer shows. By doing so, you remove the two cards that you don’t want, which is not very viable in a six-card game. Let’s try one more hand. A six-deck game with s17 always implies that you should stand on your hand 17. However, if the game is with h17, then the best step would be to surrender 17 against the ace of the dealer. When the dealer has already hit a soft 17, the probability is that he/she would end up with a total more than 17. So, the best bet is to surrender your 17 to avoid the potential of losing. If you surrender, you can lose maximum 50% of your bet, as opposed to a stand which will certainly end up in you losing more than 50% of the bet. Overall, the blackjack playing strategy depends a lot on the number of decks in the game as well as on the mix of game rules. Therefore, you should stick to a simple blackjack strategy for a specific number of decks and the playing rules in your favourite game.